Swishcraft Music is proud to announce the release of “St. Elmo’s Fire (Man in Motion)” Original Club Mix — the from Toy Armada & DJ GRIND, featuring vocals from Billboard #1 dance artist Jason Walker. This stunning remake of the classic 80’s power anthem follows Toy Armada & DJ GRIND’s smash summer single with Abigail, “Let The Joy Rise.” A Full set of House, Circuit, Future House, Nu-Disco, Tech House & Pop Anthem club mixes coming Tuesday, Sept 1st 2015. Few tracks represent an era as poignantly as “St. Elmo’s Fire.” The 1985 American coming-of-age film of the same name — starring Andrew McCarthy, Emilio Estevez, Rob Lowe, Demi Moore, Judd Nelson, Alley Sheedy and Mare Winningham— defined for a generation the angst and excitement associated with the transition from adolescence to adulthood. The film’s theme song, written by David Foster and performed by John Parr, hit #1 on the Billboard Hot 100 in September 1985 and remains one of the most iconic & uplifting power anthems of all time. Toy Armada & DJ GRIND have re-imagined “St. 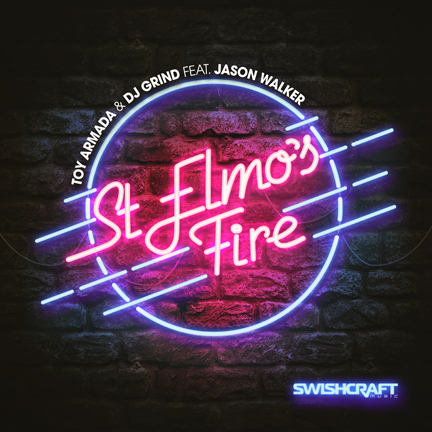 Elmo’s Fire” for today’s dance floor, with a soaring production that features sensational vocals from Jason Walker. And, a truly massive collection of remixes from some of Swishcraft’s most popular producers around the world offers interpretations across nearly every style and genre — including circuit, tech house, future house, and commercial pop. Are you ready to soar higher & higher? This Fall, prepare to feel the heat from St. Elmo’s Fire!